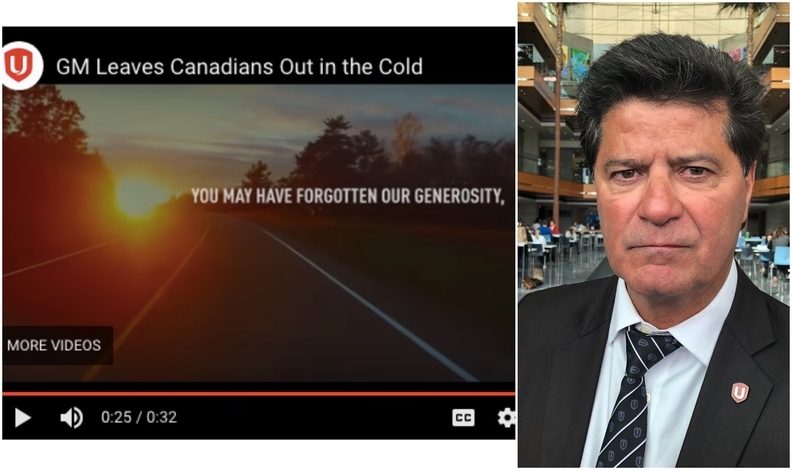 Unifor President Jerry Dias says the union will not stop airing ads about GM's decisions to close its Oshawa, Ont., assembly plant near Toronto. General Motors Canada, through its lawyers, is demanding Unifor stop broadcasting and streaming an ad the company calls “knowingly false and misleading” or face legal action. According to the letter, released by Unifor, the automaker is seeking to stop the broadcast of Unifor’s "GM leaves Canadians Out In The Cold" commercial from airing during the Super Bowl Sunday and on all other platforms, including social media, thereafter. A GM Canada spokeswoman confirmed the authenticity of the letter Sunday. And the ad aired as scheduled Sunday night. “The Advertisement, which is clearly intended to promote Unifor’s business interests and calculated to disparage GM’s business interests, contains several statements that are knowingly false and misleading in a material respect,” reads a letter, dated Feb. 1 to Unifor from lawyer Kevin Sartorio of Gowling WLG. The Canadian and Ontario governments in 2009 providedGM, which was facing financial collapse, with a bailout in the form of a repayable loan worth about $10 billion. GM has since repaid the loan. Unifor told Automotive News Canada on Sunday it has no plans to remove the ad from any platform, including the Canadian broadcast of the Super Bowl on CTV, CTV2 and TSN. General Motors Canada says it produces more than 210,000 vehicles annually at its Ingersoll, Ont., CAMI plant. “Roughly the same as our total retail sales in 2018 and we build over 740,000 engines and transmissions per year in our St. Catharines plant. Several OEMs don’t build here at all,” the automaker says on its website. General Motors in November said it would no longer allot product to the Oshawa factory, employing about 2,600 hourly workers, beyond 2019. The automaker is halting production of the Chevrolet Impala and Cadillac XTS and it will also end the shuttle program, which sees unfinished outgoing models of the GMC Sierra and Chevy Silverado shipped to Oshawa from Indiana to be completed. If the union doesn’t pull its ads, the automaker says it will have no choice but to pursue civil legal action. “GM expressly reserves its rights to avail itself of all available legal and equitable remedies for the unlawful and malicious conduct described, including but not limited to the right to obtain injunctive relief and to recover all losses or damage to GM’s business and reputation resulting from the same,” the letter says. A second Unifor commercial urges consumers to take an online pledge not to buy GM vehicles made in Mexico. The ad demonstrates how consumers can easily identify where a vehicle is made through the Vehicle Identification Number (VIN). If it starts with three it is made in Mexico. “We import just three models from Mexico out of 47 we sell in Canada. The ‘VIN 3’ campaign just hurts Unifor’s members at GM Canada’s plants and over 60 Canadian suppliers who make parts here for Mexico in NAFTA,” GM says. General Motors Canada has asked Unifor to stop broadcasting an ad about the automaker's decision to close its Oshawa, Ont., assembly plant.